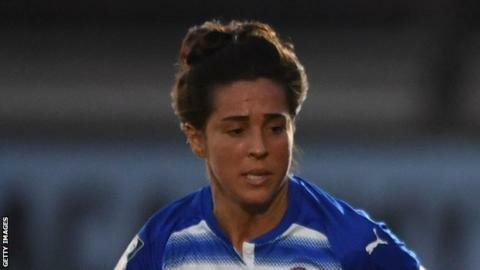 Reading Women began their Women's Super League campaign with a convincing 4-0 win over Yeovil Town Ladies. Gemma Davison opened the scoring, chipping goalkeeper Megan Walsh after five minutes, before Fara Williams doubled their advantage. Lauren Bruton coolly added the third from the penalty spot after Amy Goddard fouled Davison. The Royals netted again from the restart, with Remi Allen rising to head home Natasha Harding's cross. Yeovil failed to win any of their 18 league games last season, and only scored twice during the campaign. The Lady Glovers, managed by former Millwall Lionesses boss Lee Burch, huffed and puffed their way to a smattering of half-chances, but never looked like they would find a route back into the game and end a winless run that now stands at 35 matches. After Kelly Chambers' side dominated the opening exchanges, Yeovil won their first corner on 30 minutes and enjoyed positive 10-minute spells either side of the break. But Reading could have had more as England international Davison picked out Brooke Chaplen inside the area, who drew a goal-saving challenge from Hannah Short, with Chaplen spurning the rebound just wide before she could make it five. Match ends, Reading FC Women 4, Yeovil Town Ladies 0. Second Half ends, Reading FC Women 4, Yeovil Town Ladies 0. Gemma Davison (Reading FC Women) wins a free kick in the attacking half. Foul by Georgia Evans (Yeovil Town Ladies). Attempt saved. Brooke Chaplen (Reading FC Women) header from the centre of the box is saved in the bottom right corner. Assisted by Mayumi Pacheco with a cross. Attempt missed. Olivia Fergusson (Yeovil Town Ladies) right footed shot from outside the box is close, but misses to the right. Assisted by Megan Alexander. Attempt saved. Emily Syme (Yeovil Town Ladies) right footed shot from outside the box is saved in the bottom left corner. Assisted by Olivia Fergusson. Foul by Rachel Furness (Reading FC Women). Leah Burridge (Yeovil Town Ladies) wins a free kick in the defensive half. Attempt missed. Brooke Chaplen (Reading FC Women) right footed shot from the centre of the box misses to the right. Assisted by Jo Potter. Foul by Gemma Davison (Reading FC Women). Attempt missed. Gemma Davison (Reading FC Women) right footed shot from outside the box misses to the right. Assisted by Lily Woodham. Substitution, Yeovil Town Ladies. Leah Burridge replaces Ann-Marie Heatherson. Attempt missed. Charlie Estcourt (Reading FC Women) left footed shot from the centre of the box is close, but misses to the left. Assisted by Gemma Davison with a through ball. Attempt missed. Brooke Chaplen (Reading FC Women) left footed shot from the left side of the box is close, but misses the top left corner. Assisted by Gemma Davison with a through ball. Gemma Davison (Reading FC Women) hits the bar with a right footed shot from the centre of the box. Assisted by Rachel Furness. Georgia Evans (Yeovil Town Ladies) is shown the yellow card. Lily Woodham (Reading FC Women) wins a free kick in the defensive half. Attempt saved. Brooke Chaplen (Reading FC Women) left footed shot from the left side of the six yard box is saved in the centre of the goal. Assisted by Gemma Davison with a through ball. Attempt missed. Rachel Furness (Reading FC Women) header from the centre of the box is high and wide to the left. Assisted by Jo Potter with a cross following a corner. Corner, Reading FC Women. Conceded by Megan Alexander. Attempt blocked. Natasha Harding (Reading FC Women) left footed shot from the right side of the box is blocked. Assisted by Lauren Bruton. Attempt missed. Gemma Davison (Reading FC Women) right footed shot from the left side of the box is too high. Assisted by Lily Woodham following a set piece situation. Lauren Bruton (Reading FC Women) wins a free kick on the left wing. Foul by Amy Goddard (Yeovil Town Ladies). Substitution, Reading FC Women. Charlie Estcourt replaces Remi Allen. Attempt blocked. Rachel Furness (Reading FC Women) left footed shot from outside the box is blocked. Attempt missed. Lauren Bruton (Reading FC Women) right footed shot from outside the box misses to the left. Assisted by Lily Woodham. Substitution, Yeovil Town Ladies. Emily Donovan replaces Amber Gaylor. Offside, Reading FC Women. Jo Potter tries a through ball, but Brooke Chaplen is caught offside. Remi Allen (Reading FC Women) wins a free kick in the defensive half. Natasha Harding (Reading FC Women) wins a free kick in the defensive half. Foul by Megan Alexander (Yeovil Town Ladies). Goal! Reading FC Women 4, Yeovil Town Ladies 0. Remi Allen (Reading FC Women) header from the centre of the box to the bottom left corner. Assisted by Natasha Harding with a cross. Goal! Reading FC Women 3, Yeovil Town Ladies 0. Lauren Bruton (Reading FC Women) converts the penalty with a right footed shot to the bottom left corner. Penalty Reading FC Women. Gemma Davison draws a foul in the penalty area.